After losing my name on Facebook to a vindictive high-visibility online troll, I penned a blog post, “The Importance of Names“. In recent days, I have been able to reclaim my online name / DNA intellectual property. This has been made possible because of the diligent efforts of a very organized and tenacious community of drag queens and others within the LGBT sphere. I am grateful more than I can say to Miss Roma and Lil’ Miss Hot Mess and all who fought so long and so hard for their patience and dedication and sense of fairness in going after Facebook’s real name policy. Recently, I have seen posts coming across my feed that somehow Pagans et al are being “targeted” by Facebook in some sort of modern day persecution. I am never sure why these folks seem to think that everything is an inconvenience is somehow someone “targeting” them because of their beliefs or how they look, dress or how they think. While it is true that the dominant culture, and especially corporations within the dominant culture do this, unfortunately, I think that the concept of persecution in this case is more than a little inaccurate. Let me state at the outset to those in the Pagan and Polytheist communities that this is not about your religion. My case was very probably a personal vendetta by someone else, and Facebook’s real name policy played right into this. For most people losing their chosen screen names, whether they be professional names, pseudonyms for those who want to avoid abusers, American Indian tribal names, or Initiatory names of those within the alternative faith communities, it is only about one thing. It is about the money that your information, online and buying habits represent to advertisers, both current and potential, on Facebook. Having demographics be as accurate as possible to those potential advertisers who are more than a little interested in what you do, what interests you and how you spend your money online . In short this is not about “targeting” any group for who and what they are. This is about Facebook selling YOUR demorgraphics and YOUR information to advertisers. They cannot effectively do that when you have a pseudonym of any sort. When I lost the name of Fanny Fae on August 29th and had to use my birth name up until last week. With the help of Lil Miss Hot Mess and her forwarding my information as per the instructions, I was able to get my name back in less than 12 hours. YMMV. If you have lost your chosen Facebook name for WHATEVER REASON, please click the bright “My Name Is” button below and FOLLOW THE INSTRUCTIONS. There are no guarantees, but if people are losing their names, then they must be both methodical (and CALM!) about getting them back. All of the bleeping screaming about religious discrimination, ranting and online petition signing isn’t going to do a goddamned thing. Beat a pillow, scream if you need to, but wait and come back to the keyboard when you are calm. Sure it is frustrating and it hurts and it can leave you exposed and vulnerable and it can cut at the very essence of who you are. Those things can make it feel as if it is very personal. I promise you, it most probably isn’t. The key, however, is to keep your wits about you and push back with singular determination. Facebook sees you as just a packet of information to be packaged and sold. That’s the business they are in. Changing an imbedded corporate policy is never easy, but if you are tenacious, it can pay off. It is more than past time for the pagan community etc. to quit their mooing and start doing! It would also be a wonderful gesture if some who are able to benefit and get their names back after this Facebook fiasco to actually remember to take the time to thank Sister Roma and Lil’ Miss Hot Mess for what they have done to make this possible. Because of them and their efforts Facebook has now implemented the following policy – which many still are unaware of. Facebook just implemented the policy allowing people to select names other than real names so that they know – but that you can keep yourself safe. What Other Names are Allowed on Facebook? As I have said repeatedly, there are no promises for everyone being able to get their assumed names back. However, since I am writing this after having direct experience I have found that if you really are focused, it is possible to get what you want in all of this. Try it and see. We just need to dispassionately lay out the facts to the powers on Facebook that be because each request to get a name back is being reviewed on a case by case basis. Speaking only for myself, I know that I am fortunate and probably got my name back very quickly because I have been branding with this name for more than a decade. I own the domain, I write on multiple sites under this name and it is pretty clear that I have been out there. Others may not be so lucky, but when you are armed with as much of your information as possible, chances are Facebook will take that into consideration. It is up to each user to make their case, because to Facebook’s marketing team, you and your habits online are $$$. They are in the business to make money. So why did this happen in the first place? Let’s be honest; in spite of Mark Zuckerberg’s frequent and very public protestations to the contrary over the years, Facebook’s Real Name policy is NOT about safety or trust. It is about money, and the bottom line is always about the bottom line in corporate culture. While Zuckerberg thinks that anyone who uses a pseudonym or alternative name has a personal integrity that is lacking, that argument is disingenuous. What is really being left unsaid is that the users who use an alias only have “less integrity” in terms of the data that those who use of Facebook provide to their real customers: the corporations and advertising folks who mine that data in order to sell we the users of Facebook to those advertisers or those interested in all of the things we do and are interested in online. The deal is that those advertisers want your eyeballs and what’s in your wallet on their merchandise. In a word, WE and our buying choices as consumers, are in fact, the product. This is why the Facebook website / service is “free”, and is almost certainly likely to remain so because your information is just that valuable to them. We need to now ask ourselves, just how much are we willing to give up to Facebook and other companies who sell our information to those who wish to buy the best and most information according to that demographic data. Another point of interest is that around the time all of this real name push started was when Facebook announced the launch of its Atlas system, which was created as a direct competitor to Google’s in terms of demographic information that could be sold to advertisers and influence the buying public. Facebook acquired Atlas from Microsoft and recently announced the relaunch. Atlas essentially measures demographic information of users so that marketers can use that online information to target advertising to the right place. If you are using Gmail or using Google as a search engine of choice, you see this in action without even thinking about it. Facebook wants to compete with this for their own profits and consumers are being managed any way possible in order to insure this. Thanks to one of my Facebook friends, I found in a USA Today news story that Facebook’s chief product officer, Chris Cox recently apologized for the outing off the Drag Queens and LGBT community at large for forcing them to use their real names. I applaud the apology, but nowhere in the article was it outlined how these brave queens and others in the LGBT community, including myself, would be able to get back our assumed names. That, thankfully, would come later. I have my feelings about who the single user was who outed or doxxed so many, including myself. But of course, I know that we probably will never know for sure, but I am absolutely certain that Facebook never let any of those who were harmed know who was responsible. However, the chain of events were far too closely related in my humble opinion to be mere happenstance. I don’t trust either party in this case. 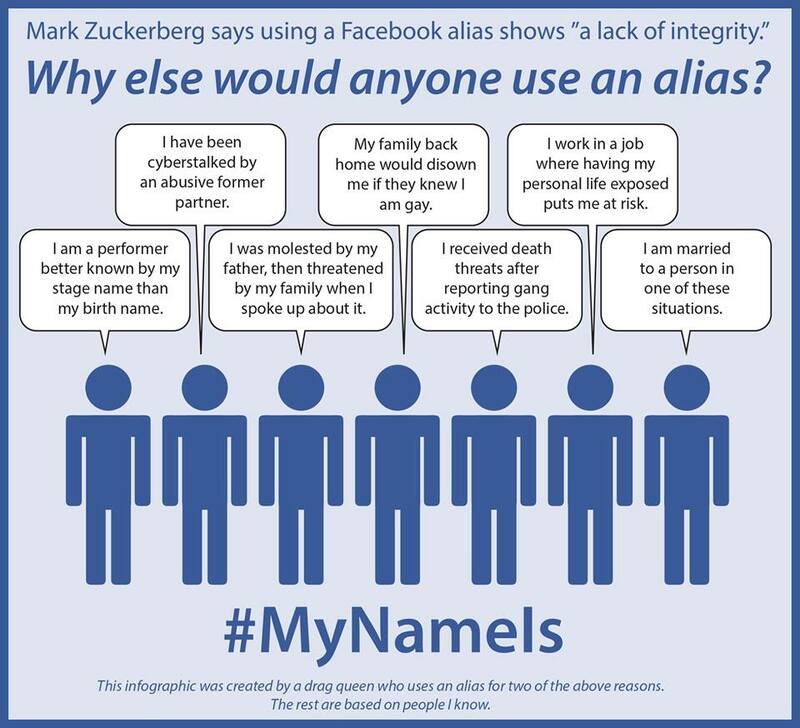 We certainly should be aware that corporations such as Facebook care little to nothing about the individuals behind the accounts or their reasons for choosing to use a pseudonym or assumed name. They only know that when a user chooses not to use the name that is on a birth certificate or driver’s license, the information it can present to those wishing to know the most about you (eg. advertisers and marketers) have skewed information and is not worth as much as if you were to use your given name. If you are a witch and you use your initiatory name online as a way to keep yourself safe and your boss and coworkers out of your private life, for example, that is not going to be the name on your credit card or your PayPal or bank account. Advertisers want you to make buying decisions based on the information they serve up to you on a constant basis. This is how if you click a story link, three other “related stories” will pop up under the link to the story that caught your eye in the first place. Again, that adds up to clicks per view and companies pay handsomely for those ratings. And they are not content to just be on your desktop at home or at work: They want to be on your mobile devices and be able to locate you and market to you based on where you are and what you are looking at or near on a real-time basis. If Facebook can pull that off, that is big time money. If you use an assumed identity, that again, changes the viability and the effectiveness of that information. Facebook and the advertisers purchasing that information know that all too well. And now, so do you. Being forewarned is being forearmed and representing yourself online as you see fit and insuring your own personal safety, Facebook’s marketing demographics be damned, is all about getting your own power back. http://silverravenwolf.wordpress.com/2014/10/23/facebook-enacts-witch-hunt-by-author-silver-ravenwolf/ was only a matter of time before someone called it a witch hunt. Boy sometimes I’m ashamed of the Pagan community.